Though the final stretch of the season has been rough for the Chicago Wolves, losing four of the last five, one of the highlights has been the emergence of 24-year-old centerman Bryce Gervais. 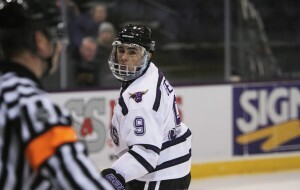 Gervais signed an amateur tryout agreement (ATO) on Mar. 24 after four years at Minnesota State, where he accumulated 101 points (67 goals, 34 assists) in 163 career collegiate games. The Battleford, Saskatchewan native’s 67 goals rank second all-time in MSU’s history. The transition to professional hockey usually takes some time to adjust. But for Gervais, it is has been pretty smooth. In seven games with the Wolves, he has four goals and an assist. Gervais notched his first professional two-goal game Friday evening in a 4-3 loss to Grand Rapids. “It’s definitely a different experience playing more than two games in a week,” Gervais said. “The pros are a little faster. Guys are a little bigger. It’s more physical, but that’s about it. With this early success, Gervais is making a solid case to get his first pro contract this summer. What’s next for the Wolves? Chicago will finish out the final three games of their season with two contest on the road against the Milwaukee Admirals on Tuesday and the Iowa Wild on Thursday and will play their home finale versus Iowa on Saturday.